Volume 1: Infertility provides comprehensive information on the modern-day approach to all clinical aspects of assisted reproductive technology (ART). It is a well-designed illustrated textbook which covers in depth, yet crisply the entire armamentarium of ART from basic principles of reproductive anatomy, physiology and endocrinology to the latest scientific advances. The book also provides updated optimal information on evaluation and management of an infertile couple, ethical and legal issues in ART as well as ART guidelines. Recent advances such as uterus transplant, ovarian transplant, endometrial stem cells, and its clinical applications provide newer insights into infertility management. Volume 2: Laboratory Aspects of IVF & Andrology covers all aspects of assisted reproductive technology (ART) laboratory techniques from designing and planning the in vitro fertilization (IVF) laboratory to step-by-step laboratory procedures with precise outlining of each procedure, protocols for best outcome, troubleshooting, and quality maintenance. Complex and specialized procedures are described by experts providing a foundation of good working practice to ensure high quality and success. This edition is fully updated to include new material such as total quality management in the ART clinic along with an illustrative example of a “well-run” clinic. This volume serves as an essential guide for all clinicians, embryologists, and IVF laboratory staff. Volume 3: Atlas of Human Embryology is a pictorial depiction of all aspects of embryology covering a wide range of topics from cumulus oocyte complex evaluation to embryo biopsy. It provides an exemplified demonstration of basic laboratory techniques such as intracytoplasmic sperm injection (ICSI), in vitro fertilization (IVF), cryopreservation and embryo biopsy as well as a detailed insight into oocyte and embryo scoring. 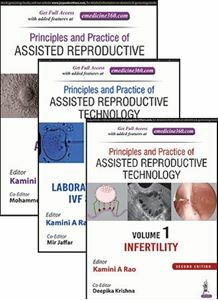 This edition has been updated with recent advances in ART namely magnetic activated cell sorting (MACS), embryo biopsy (both blastomere and trophectoderm), significance of time lapse monitoring in the selection of embryos with abnormal fertilization along with clinically relevant live good quality images which can help readers to assimilate and better understand procedures. This book will not only aid an embryologist in clinical work but will also serve as an imperative tool for learning and teaching purposes.